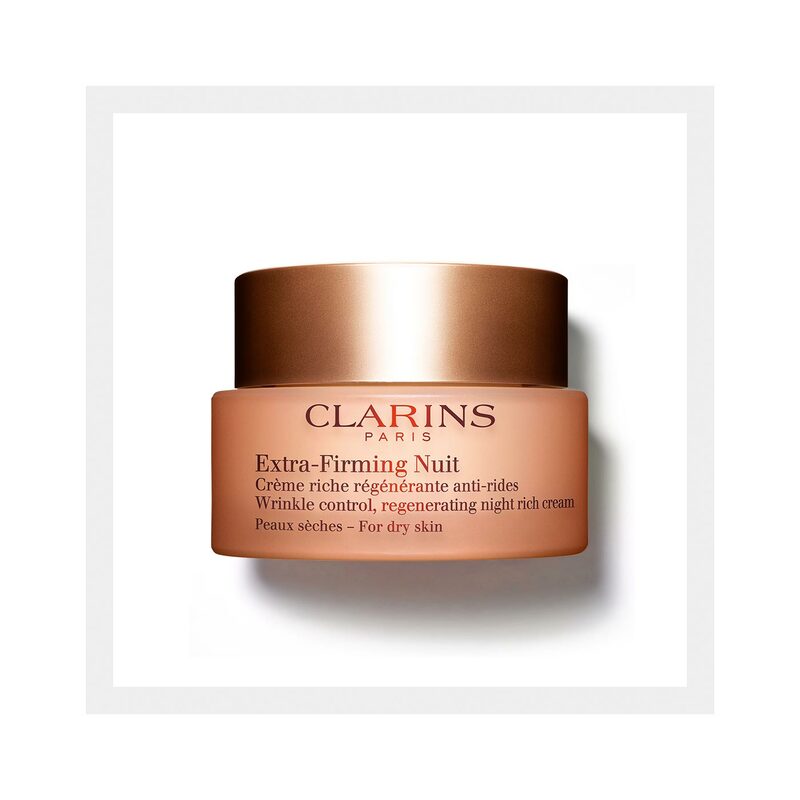 Extra-Firming Night Cream for dry skin - The expert firming wrinkle control night cream that puts the spring back into your skin. Key ingredient, extract of kangaroo flower, helps plump and firm the skin, while Moonstone Hydrated Silica encourages night-time regeneration to maintain the skin’s youthful qualities. Rated 5 out of 5 by lizzyyore from This REALLY does work! I ave been using clarins since the early 90s and used this cream then. It was very heavy and had a really disgusting smell. now I've redicovered it after beeng sent a trial sample and I love it. It smoothes along my skin and I feel really moisturised in the morning. It works without you 'feeling' it. I've read the reviewers comments about the 'old' version'. But this is really new and improved. Rated 5 out of 5 by Eves from love it used Clarins for over 30 years and love the extra firming range. I love this new extra firming range even better and hope they bring the neck cream and the rest of the range out too. Rated 1 out of 5 by Jane544 from So Disappointed I have used this moisturiser for years and years and am totally devastated that it has changed. It was such a lovely rich moisturiser and will struggle to find an alternative. I’ve just finished my first pot of the new cream and will definitively not be buying more. I have no choice but to use an alternative brand. Rated 5 out of 5 by Jacks mum from Love it I bought this a couple of weeks ago and I love it. It has made my skin lovely and soft, it absorbs well. I also use the day cream and couldn't be happier. Rated 1 out of 5 by Noobs from So disappointing! Please bring back the old formula. I knew from the moment I applied this that it lacked the richness of the old cream. As the previous reviewer said, why change something that isn’t broken! Rated 1 out of 5 by Caroline B from AWFUL!!! If I could give it 0 stars I would. I have been using Clarins products for 35 years and they have always been fabulous... until now. I used to love the extra firming night cream for dry skin and my skin would feel and look lovely in the morning but since you have recently changed to a new formula my skin is now extremely dry and the new cream does not absorb at all. It’s almost like it forms a plastic film on top of my skin. You’ve lost a very loyal customer as I will be going elsewhere from now on. Don’t try and fix something that isn’t broken.